Disclaimer: This post is sponsored by Lilly’s, but all opinions are my own. Thank you for supporting the brands that I love! Anyone that knows me, knows I am a huge hummus lover. I eat it almost everyday. I often make my own, but when I don’t, I buy Lilly’s hummus. I used Lilly’s Smoked Tomato and Basil Hummus to make this Roasted Vegetable Hummus Pizza. The thing I love about Lilly’s is that there is nothing weird in their ingredient list. They keep it simple just like you would if you were to make hummus at home. It’s hummus the way it is supposed to be. I also love that it’s organic, vegan and gluten free. Lilly’s has also been non-GMO verified by a third party. Lilly’s comes in a variety of flavors, so you will never get bored. To find Lilly’s product nearest you, check out their product locator. 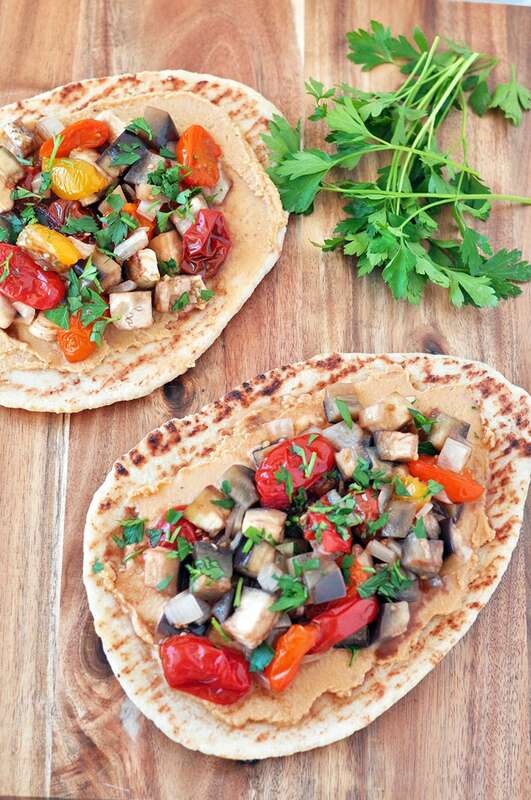 Hummus is so much more than a dip for veggies! It’s super versatile as I show you in this easy and healthy pizza recipe. I thought the flavors of the smoked tomato and basil would go really well with the balsamic roasted veggies. I was right! Lilly’s is also going to give one lucky winner some Lilly’s swag + free coupons for hummus. To enter, just leave a comment under this blog post. Open to US residents only. Winner will be notified via email. Good luck! A simple and healthy meal that is full of flavor! Cube eggplant, salt and place in a colander for 20 minutes to draw out some moisture. After 20 minutes, add all the ingredients, except the hummus and flat bread, to a large bowl and mix until everything is well coated. Spread the veggies onto a lined baking sheet. Bake for about 35-40 minutes, stopping halfway to flip everything. Once the veggies are roasted, assemble the pizzas. 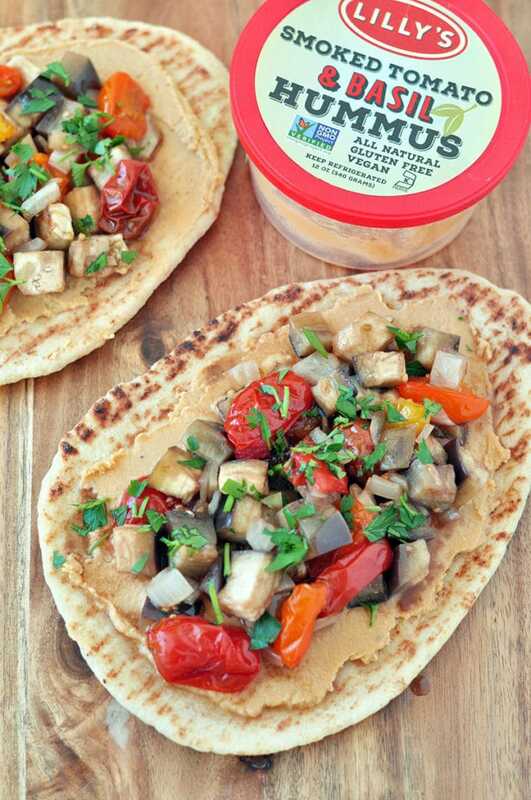 Spread the hummus on top of each pita/flatbread. Woooo I love hummus too! And roasted veggies! What a terrific new way to use both--I now have dinner plans for Saturday. Thanks, Melissa! Thanks Amy! I hope you enjoy it! Hi Melissa! Have you ever made or tried hummus without the tahini? I know it wouldn't really be hummus anymore but we now have a sesame allergy in the family... I'm wanting to make "hummus" again but altered. Wondering if you have any experience or thoughts or maybe some of your readers/followers have. Thanks! Also, I loved hearing about your Vegas info. We will be going to the are for a few days in the upcoming months. We stayed in a pet free hotel near red Rock and wanted to hike there! Now we have new food spots and hiking ideas. Thanks! Hi Julie! Yes, you totally can. You can use sunflower butter instead of tahini. The taste will be slightly different, but it will still be good. This sounds so good! I can't wait to try it! We love pizzas, I can't believe I never thought to use hummus. Yum! 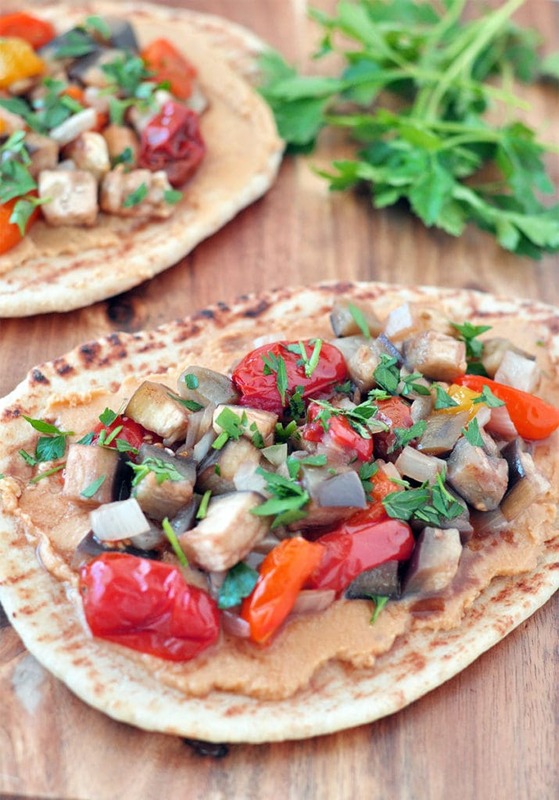 I love hummus and veggies in tortillas as an easy lunch/dinner, I should try this as well. I hope you enjoy the recipe Brandy! This looks very yummy! What a great idea for a plant based pizza. Timing is perfect! Found your post as I searched Lilly's because I bought some smoked tomato and basil...while traveling! Thankfully, I found it available at my local Fry's based on your product locator. Delicious. Thanks for the recipe! You are so welcome! Glad you found some Lilly's! Love hummus bUT I've never tried Lilly's! Hummus is such a versatile ingredient, we've used it on pizza, in pasta, pita wraps, sandwiches and as a vegetable/chip dip. My kids love it too, mostly as a dip with pita chips/bread. My favorite flavor is red pepper.